As June began Friday, so did our programme in Romania. June 1st is Children’s Day and a national holiday in Romania. 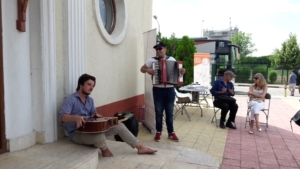 It was perhaps fitting then that the EMIN began its awareness tour for better living conditions and minimum income when one in two children in Romania go to bed hungry. 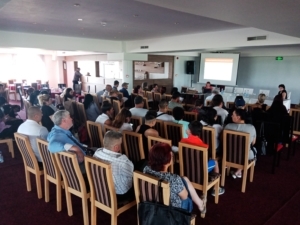 The event organized by RENASIS was filled with a vast array of disciplines, from university social policy professors, trade unionists, and social researchers to grassroots Roma activists. It was a rewarding, humbling and educational event. Some of the issues that came up were sadly all too familiar: inadequacy of minimum income schemes, non-take up minimum income especially among residents of urban areas (value of the minimum income is too low and the administrative effort to access it too high) and stigmatization of people in need of Minimum Income face when they are reliant upon such schemes. Like in many other European countries, Romania faces media hostility towards people who they believe are beneficiaries of minimum income schemes. He also spoke of how many people are either too embarrassed to access schemes when they are in need of them due to pride around how they would be perceived in society. An all too common feeling of being portrayed as either lazy or not paying their way. Tackling such hostility is at the center of the EMIN awareness tour as we try to bust the many myths surrounding minimum income. The event in Giurgiu benefitted from the presence of Macedonian, Finish and Bulgarian colleagues who also made short contributions, their participation in the event was highly appreciated by people present at the event. One intervention spoke about how many other Romanians are actually unaware of the existence of Minimum Income schemes in the country. Despite the lack of uptake of these schemes, even when they are used for those who are unemployed or are living in poverty, they are almost totally inadequate in correlation with the reference budget. At the current moment civil society activists in Romania are actually working on a project to provide an updated reference budget for 2018. It is safe to assume that this new reference budget will show that the current Minimum Income scheme will be even more inadequate than it currently is. Minimum Income Schemes in Romania have also been discussed in the context of the current structure of the labour market and the job offers available for people accessing minimum income. A new coalition has been formed in the recent years made of trade unions, civil society organisations and politicians and is working towards changing labour legislation. They mainly focus on precarious jobs (those offering poor working conditions and payment despite regular employment contracts) and atypical forms of work such as piece labour that is fairly wide spread in Romania, but also on strengthening the capacity of trade unions to work with people in precarious jobs and support them to get unionized. Research done as part of the coalition’s work shows how workers are often employed in jobs that lack security and violate their rights as the law often favours employers. Workers work in poor outdoor conditions without prerequisite health checks in all kinds of weather, which can and does affect their health in a negative manner. These jobs come without social insurance or long term security and workers who are dependent on this income can be made redundant at a moment’s notice at the whim of their employer, without any redundancy package to help their families until they find new employment. The final speaker of the day was a young Roma activist who has helped people in her community and further afield in accessing health and Minimum income schemes. To hear about the reality of poverty in her community from a grassroots activist was a very sobering experience. She spoke of the desperate measures many families often have to take to access minimum income schemes, and how they are often put into humiliating circumstances by social workers sent to access their application. This process of dehumanizing and stripping the dignity of the most vulnerable in our society is unacceptable and is one of the core elements of our EMIN awareness campaign. 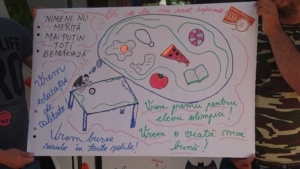 The Roma activist also organized a participative workshop with local students from Giurgiu. 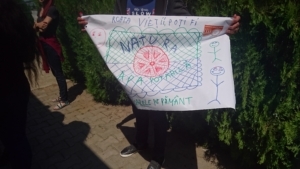 The teenagers produced a visual representation of the debate, and it was encouraging to see in images the messages of hope that a younger generation took away from our event. These images were displayed around the bus during our post event happening, when were also join by an incredibly talented accordion player who dueted with our resident musician to create some beautiful Melodies.